Nightkeep is a mix between metroidvania and JRPG games into one epic platformer. It’s a colorful platformer that’ll instantly remind you of SNES classics like Castlevania, Demon’s Crest, and even some old-school Donkey Kong elements. It’s an action RPG platformer with pretty graphics and a tight control scheme. If you grew up with these legendary titles, you’ll instantly get hit with the nostalgia. The artwork is just amazing and will bring you back to the past. You play as a few different characters in a mysterious and eerie game world. It’s happy, yet daunting at the same time. The game is based on quests that earn you “rank points” that you can use to upgrade your skills (like SP). This, in turn, will bring up new quests and is a critical part of the story. There’s the main story and side quests all over the world. The side quests are optional, but they’re actually really interesting to play through and you’ll find yourself lost for hours in them. They add to the storyline because they’re not off on a huge tangent. You can use basic melee weapons such as swords and whips and you can use abilities like sliding and dashing. Eventually, you can use magical abilites as well. And of course, there are platforming elements with all sorts of scenarios. There are also a ton of different enemies like bats, spiders, and mushrooms. 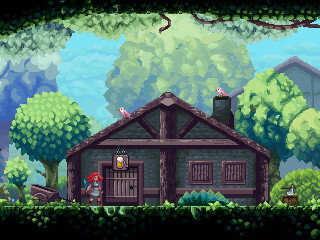 You travel through multiple environments like dense forests and towns. If you like JPRGs, you’ll probably like Nightkeep. There are epic boss fights and rare monster fights as well. You can pick up some awesome loot if you’re successful. Rare monsters are rare. They only appear once and you only have one chance to kill it and grab its loot, so be ready for them. Nightkeep has a vast world and is extremely difficult. You can only melee at first but then you eventually use magic. The game does have its mercy points, but overall it’s a difficult platformer. The game is still in early access alpha and is available for download. The artwork, soundtrack, and characters are all original. There’s a leveling system equipable items, power-ups, and some parts are rogue-like. In total, the game sports over 70 items and even multiple endings to add replayability. You can check out the game in its alpha demo before it goes big. It’s a gem.